A charming walled medieval village. This sleepy village is almost picture perfect- from its medieval walls and timbered houses with easy access to the countryside for long walks through green fields. In Burgundy, about 3 hours south of Paris. Map. 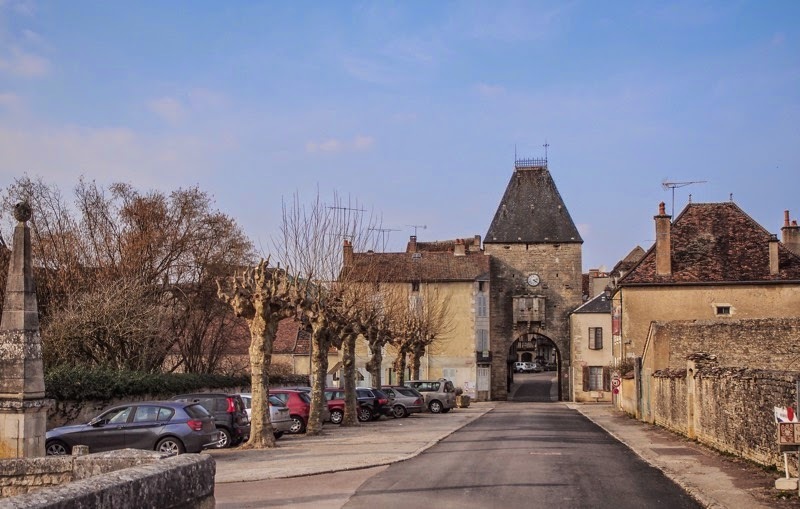 Noyers to me typifies Burgundy: beautiful stonework, historic buildings, green fields, streaming water, moss, and impressive trees. Stones, moss, water: it sounds like enough to make a zen monk salivate and indeed, Noyers is peaceful and calming. 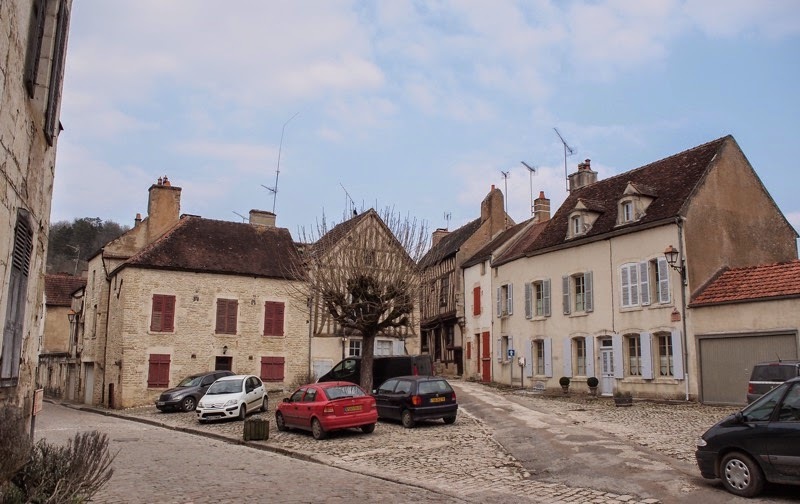 It is situated outside the main wine-growing areas and although it does get some visitors (and has been selected as one of France's 100 most beautiful villages), usually it is a quiet village that pretty much looks like it did a few 100 years ago (if you take away the randomly parked cars that is.) If you spend a few days here you'll probaby get to know all 700 inhabitants quickly enough. 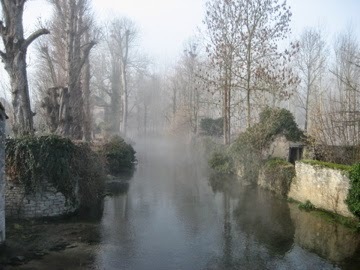 Noyers sits in a meandering loop of the slow-moving Serein, a small stream that historically has been used to power the local mill. The town is protected by the original medieval walls, featuring 19 towers, and surrounded by the river on 3 sides. On the east side, the river comes close to the town, leaving just enough space for a pleasant walking path between town walls and river. Promenading along the Serein river, just outside the walls. 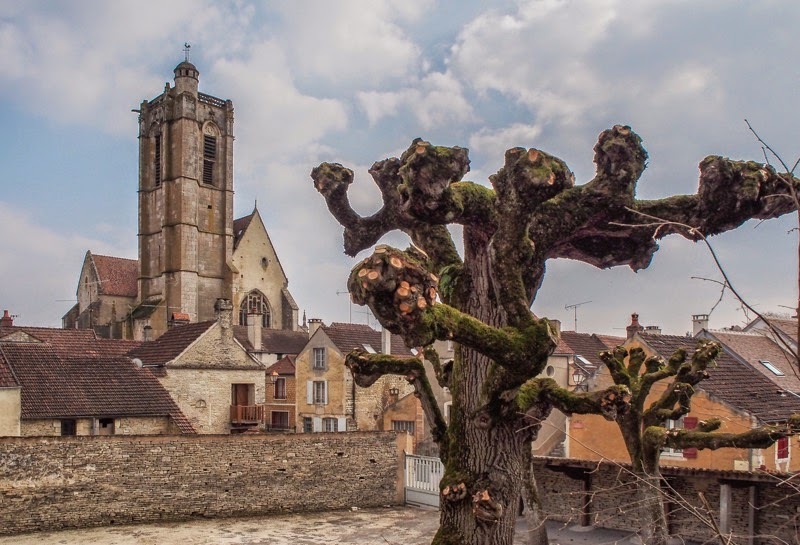 Stone buildings, old trees and moss are all part of the zen-like Burgundy landscape. Inside the town walls, many buildings date back to the 15th and 16th centuries. If you were to draw an imaginary fairytale village, this is probably what it would look like. There are some pretty half-timbered houses, many of them with detailed wood carvings. Carvings on one of the many half-timbered houses. ...as well as through the gate on the north side. A Renaissance house, with elaborate stonework and a gabled window. Here's your word-of-the-day: Noyers is rich in pollarded trees. It almost seems like somebody colour-coded this town in order to create a very French study in biscuit-coloured stone and pale blue. It all adds to the prettiness. 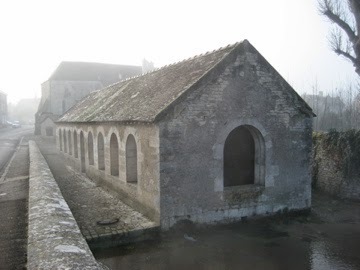 Just outside the walls sits the old lavoir, the communal washhouse. No longer in use, it still makes for a pretty sight, especially on a misty autumn morning.